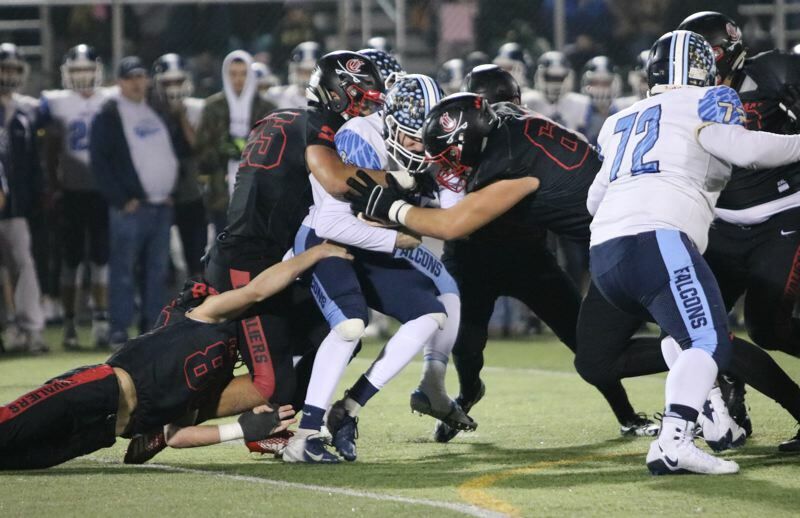 Clackamas High School's hard-nosed defense knocked the legs out from under Liberty's high-scoring offense Friday night. The Cavaliers weren't too shabby when they had the ball, either. Clackamas quarterback Caleb "C.J." Jordan threw two touchdowns passes and rushed for two other scores as the Cavaliers rolled to a 59-21 win over the Falcons in Friday's OSAA Class 6A football quarterfinals at Cavaliers Stadium. The top four seeds all advanced to Friday's semifinals at Hillsboro Stadium will top-ranked Lake Oswego (11-1) will take on No. 4 Jesuit (11-1) at noon, followed by No. 2 Clackamas (12-0) against No. 3 Sheldon (10-2) at 5 p.m.
"It means you've had a very good season," Clackamas coach Joe Bushman said of reaching the semifinals for the third year in a row. "Not a great season yet, but a very good one. "Anytime you get to the very end and you give yourself a chance to be one of those teams with a chance to win it all, it's pretty awesome." The Cavaliers set the tone early against Liberty, scoring on three of their first four possessions and taking a 21-0 lead before the Falcons (9-3) had crossed midfield for the first time. After Liberty battled back to within 28-14 at halftime, Clackamas reeled off four touchdowns in the first 10 minutes of the second half, including Owen Brusco's 68-yard fumble return that made it 56-14 and helped put the game out of reach with 2:13 to play in the third quarter. "These guys worked hard and fought hard to get here. They set a new standard for Liberty football and we'll be back." Clackamas racked up 608 yards of total offense, but the difference in the game was a Cavaliers' defense that limited Liberty's triple-option offense to 302 yards offense and held the Falcons under 30 points for only the second time this season. "Everyone had a job to do and everyone did their job," said Kelsen Hennessy, the Cavaliers' 6-foot-5, 260-pound tackle who anchored the defensive front alongside Cole Allen, Seth Gregory, and Justice Pagan. "It was a great team effort. "We pride ourselves on being able to get to the quarterback pretty fast and nothing ever changes for us. We always want to stop the quarterback, stop the run, and get to the ball as fast as possible and just be as disruptive as we can be on defense." The Cavaliers had 12 tackles for loss and sacked Liberty quarterback Bradley Norman six times, in addition to forcing four turnovers -- two fumbles and two interceptions. Liberty's first six possessions ended with a fumble, four punts, and a turnover on downs. Three of those drives also were set up by Clackamas turnovers -- two fumbles and an interception -- which ended up as footnotes when the Falcons failed to capitalize on any of the miscues. Again, credit the Clackamas defense. The Falcons finally gave their fans something to cheer about when Cole Smith scored on a 55-yard punt return on a kick that was partially blocked, cutting the Clackamas lead to 21-6 with 2:13 remaining in the second quarter. After the Cavaliers answered with Jordan throwing a 46-yard touchdown pass to Richard Kennewell with 1:15 to play in the half, Norman took the Falcons on a four-play, 80-yard scoring drive that ended with a 38-yard touchdown pass to Aiden Maloney and a two-point conversion run by Bryan Bafaro that made it 28-14 with 50 seconds left. The second half looked a lot like the first half, minus the Clackamas turnovers. Liberty's first four drives ended with a punt, another punt, an interception, and a fumble, while Clackamas countered with a 66-yard touchdown pass from Austin Atkeson to Kennewell, and 8-yard touchdown run by Jordan, a 40-yard touchdown pass from Jordan to Nemo Dedmon, and Brusco's 68-yard fumble return. "We had to overcome some adversity, but this group is so special because we handle adversity the right way," Cavaliers senior inside linebacker Jake Bushman said. "We don't let it get the best of us and everyone can see by the score that everyone did their job tonight, no matter if they made the play or not." Jordan, who rotates at quarterback with Atkeson, completed 5 of 7 passes for 164 yards and had 12 carries for a team-high 97 yards. Atkeson completed 8 of 11 passes for 164 yards and had 12 carries for 32 yards. Kennewell was the leading receiver with six catches for 177 yards, while Dedmon and Jailen Hammer each had two catches for 52 yards. "It's pretty amazing to think about the last three years and how we haven't lost on this field," Joe Bushman said. "Our kids really played their hearts out tonight. "Liberty is very explosive on offense. They run that option and we knew we wanted to come in and stop the run, and we were able to do that. They have some good skill guys and their quarterback is a really good player, so to be able to harness them as much as we did says a lot about our kids and our defensive staff."